Touched by an iPod! | What I think About When I Think About Writing. A number of weeks ago I lost my iPod Shuffle. I had grown rather attached to it. It was my little friend whenever I went for a walk or took a long bus journey. It didn’t cost me a penny; it was a freebie my brother picked up on his travels. A small grey thing that looked like a cigarette lighter, it clipped on my belt buckle like a pager…if I had a pager. It stored up to a hundred songs and allowed me to pick the ones I wanted. I loved it. I was scared of it at first. I had to register it with iTunes, download this, download that, and make coffee while I downloaded. I thought it was going to be real complicated; but in the end it wasn’t. The only problem I had was with the earphones – the kind you stick in your ear. Only they wouldn’t stick in my ears. It seems I have ears nothing can stick in unless it’s wax. But you didn’t want to hear that, did you? So I bought earphones that go over the ears. Not the kind that make you look like a gangsta mudda from the ‘hood, just a plain old pair of phones that would do exactly what it said on the tin: stay where they were supposed to stay. But then, as I said at the start, I lost it somewhere. I was disconsolate but I got over it. As you do with these things. But I still had to walk to places and take long bus journeys and it was at these times that I missed my little grey friend. I was lost, alone and Shuffle-less. After a period of mourning, lasting at least two months, I decided it was time to move on. So, into HMV I went. When I saw her I fell in love. Her face, her look, her feel had me at “hello.” I parted with some cash, collected an iTunes voucher free of charge and away I went. Then when I got home, the fear returned. She was so sleek, so shiny, so black, I felt she would beat me. And she very nearly did – I couldn’t get her out of her box, for starters. Bloody wrapping! I very nearly took a knife to her, until I saw a sticker that said “peel here.” I felt like a gombeen! But I bit the bullet, connected her to to my PC and waited to see what happened. Ten minutes later, I’m writing this while Lady Touch is whispering sweet nothings in my ear. I wonder what else she has in store for me. 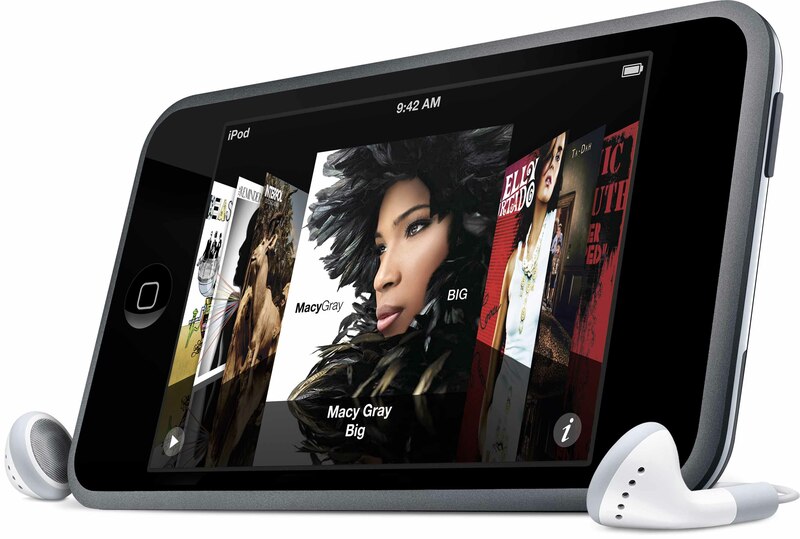 This entry was posted in Music, Technology and tagged Apple, iPod, iPod Shuffle, iPod Touch, The Lady Touch. Bookmark the permalink. 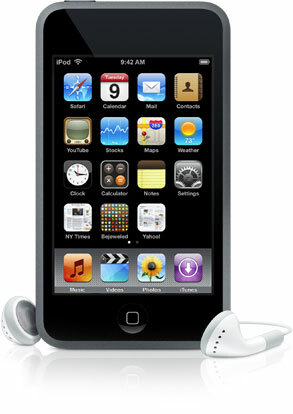 I love my iTouch – can do so many things with it. I just wish it was a bit more “shove in my pocket” size. If I have an ample supply of anything, it’s pockets. I love my pockets. We each have a Touch. I love the damned thing. It reads books to me, lets me check facebook and internet, delivers my e-mails, and amuses me with games and other apps. If it was a sexual thing Tim would be worried. You know what I do? I sing!